The E-POM team claims a strong expertise in molecular inorganic chemistry, in the synthesis of polymetallic coordination complexes including polyoxometalates (nano-scaled molecular oxides or POMs) and polycyanometalates, up to mesoscopic assemblies. 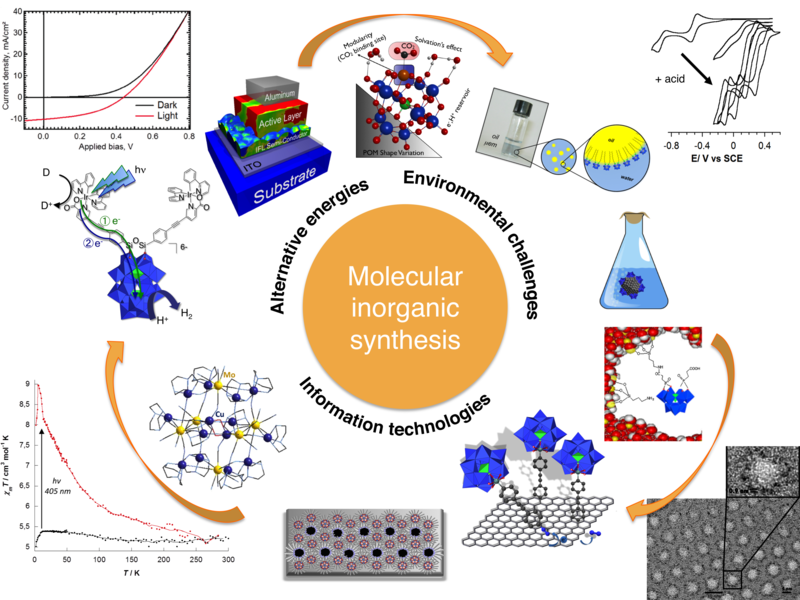 information technologies: switchable molecules for information processing and data storage. The molecular structures and the electronic, optical and/or magnetic properties of the inorganic platforms we are handling are investigated by many characterization techniques, especially multinuclear NMR, EPR, absorption spectroscopies, electrochemistry, X-ray diffraction, scanning probe microscopies. Using the tools of molecular inorganic chemistry and supramolecular chemistry, we are exploring the bottom-up approach to (multi)-functional materials for catalysis and molecular nanosciences.